Everyone knows about caviar. Some people get the chance to taste it once in a while. But for most of us, the tiny, glistening, gunmetal-grey beads are the ultimate luxury product, a glorious treat reserved for extraordinary occasions. 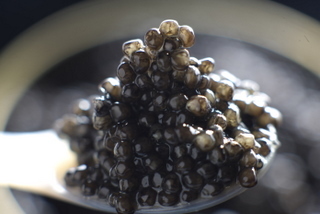 The most luxurious – and by far the most expensive – caviar has traditionally come from the roe (eggs) of wild sturgeon fished in the Caspian Sea. Unfortunately, thanks to a disastrous combination of damming, overfishing, pollution and poaching, sturgeon populations in this deep inland sea have all but collapsed. In the past decade alone they have declined by more than 90%. 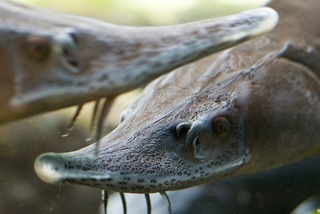 In an attempt to rebuild stocks, sturgeon has been put on the endangered species list and a ban has been placed on most wild caviar from the Caspian. So if caviar from wild fish is out of bounds, what can a caviar-loving girl to do to satisfy her cravings? Farmed caviar is, increasingly, the answer. In response to the endangered status of wild sturgeon, and given the unflagging demand for their eggs, aquaculture is taking up the slack. Sturgeon is now raised on fish farms all over the world, from France, Spain and Italy to Russia, China, Canada and the US. 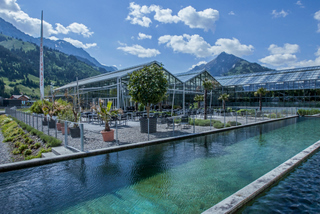 In 2009, Switzerland joined the ranks of caviar producers with the opening of the Tropenhaus in Frutigen, in the Bernese Oberland. Farming in the Alps is nothing new. But farmed caviar? It may sound a surprising proposition (shades of salmon fishing in the Yemen), but the project makes perfect – and perfectly sustainable — sense. The catalyst for this unlikely project was the inauguration in 2007 of the Lötschberg base tunnel, which enters the Alps at Frutigen and emerges the other side in the Valais. This impressive piece of engineering, explains Andreas Schmid, Marketing Manager of the Tropenhaus, posed a number of technical problems. One of these was the runoff of water from melting snow and rain, which filters through the limestone layers to the tunnel below. Thanks to the geothermal effect, the water is warmed on its descent through the mountain to a rather comfortable 18 degrees C. But to channel this warm water directly into the Engstligen River would disturb the local wild fish population. Engineer Peter Hufschmied, head of site management for the tunnel and a passionate angler, came up with a neat solution: instead of using expensive energy to cool down the water before disposing of it, why not take advantage of its naturally warm temperature to raise fish, at the same time using any surplus energy to heat greenhouses where tropical plants and fruits would grow? The Tropenhaus was born. Over lunch at the Tropenhaus Terrasserie restaurant – a tiny tasting of the precious eggs with bite-sized blinis and quail’s eggs followed by a salad topped with flakes of smoked sturgeon meat — Andreas introduces me to this ancient family of fish and initiates me into the mysteries of caviar production. The mature females are stunned and slaughtered, the sac of roe is lifted out and set aside, and the fish is deftly filleted. The fillets – firm, dense and devoid of bones – feature on the menus of the two on-site Tropenhaus restaurants, and are also sold to restaurants and shops (including select branches of the Co-op, the Tropenhaus’s main shareholder). Some of it is fresh, some smoked to give a delicacy not unlike smoked eel. Considering the mystique surrounding caviar, the process for making it appears remarkably simple, at least as demonstrated by caviar-meister Tobias Felix. First, taking care not to damage the precious eggs, he gently coaxes and massages them through a wire mesh leaving behind the membrane that surrounds them. Next, he rinses the eggs in cold water, drains them in a fine-meshed sieve and painstakingly picks out any impurities with tweezers. At this stage the eggs are a dull greyish-black; only when he adds the carefully calculated measure of salt will they take on their characteristic glossy sheen. 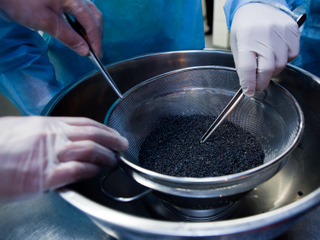 The newly salted caviar is promptly transferred into custom-made tins, which are sealed hermetically. The entire process takes 15 minutes from start to finish. For the final step, the tin is embedded in a sleek, black sphere, which in turn is enclosed in a solid chunk of glass resembling an ice cube, made at the Hergiswil glass factory on the lake of Lucerne – an ultra-chic piece of packaging that won a coveted Red Dot Design award in 2012. Hold your hand out in front of you with the thumb and fingers slightly separated (as if you were going to shake someone’s hand). Place a few pearls of caviar on the fleshy part formed by the angle between thumb and forefinger: the warmth of your skin will relax the caviar and help release its flavours. Lick it directly from your hand and let the grains dissolve gently on the tongue. 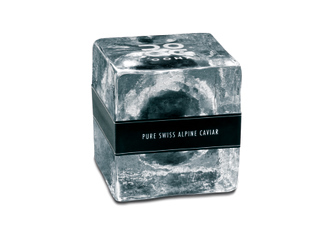 Seasoned caviar tasters look for iodised, minerally, nutty notes, a balanced salt content and lingering flavour. For a tasting, 10g per person will suffice. To serve, keep things simple: a smear of crème fraîche (lightly soured cream) on bite-sized home-made blinis with a tiny pile of caviar on top is all you need (or perhaps can afford). Serve with chilled vodka or champagne. Sift together the flours, salt and dry yeast into a bowl or the goblet of a food processor. Heat the milk to lukewarm and mix in the egg. Add these to the flour and beat or process to a smooth batter. Leave for 30-40 minutes or until the mixture is risen and bubbly. Heat a thin film of oil in a large heavy frying pan and spoon in 4 or 5 good tablespoons of the mixture to make 4 or 5 blinis. Turn the blinis when bubbles appear on the top and the undersides are golden and cook the second sides. Remove blinis to a cloth-lined plate or basket as they are ready and continue with the rest of the mixture. The blinis can be wrapped in foil and reheated in a moderate oven, or covered with clingfilm and microwaved very briefly.